Our 'What Does It Mean' series continued with an examination of our views of citizenship. What that means and how our understanding of it has changed over the years. 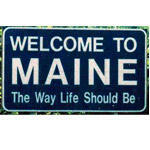 What Does it Mean to be Young in Maine? Another in our What Does It Mean series. Today we discussed the challenges facing and the opportunities available to young people in Maine?